Mt. Hood is at the eastern boundary of Clackamas County. At this point on the Oregon Trail, pioneers may have felt they were nearing the end of their journey but the sight of Mt. Hood would tantalize for another two or three weeks. The Trail had been particularly hard since leaving Ft. Hall in Idaho. An 1851 traveler wrote, "It seems the nearer we approach Oregon the worse roads we have, and a worse more rough looking country." Peter Burnett, an Oregon booster, described this Trail segment in his diary, "...a poor sandy country. Not a tree in sight all day." Fresh hell lay ahead. To leave the "suffocating dust" of the Columbia plateau, the travelers had two choices: by the Columbia River or overland (after 1845) on the Barlow Road. They could choose the water route, extremely dangerous by raft or canoe and, (after 1850) horribly expensive by steamship. The emigrants were a toughened and often famished bunch on this last leg of the Trail. Supplies and animal forage could be difficult to find. Expenses and the loss of cattle (and even hardy oxen) left quite a few of the travelers destitute upon arrival in Oregon. Most made the journey on foot, the children sometimes barefoot, walking beside their oxen-drawn wagons. Many pioneers were also burdened with grief. There's an estimated ten graves for every mile of Trail, family lost to accident, disease, and childbirth. Not too far past the end of the Barlow Road, the wagon trains camped a final time on the broad creekside meadow near the Willamette River. This spot, Oregon City's Abernethy Green, marked the traditional End of the Oregon Trail. The pioneers first view of Oregon City contrasted sharply with the wild and deserted country they were leaving behind on the Trail. Homes, churches, and small businesses made a community several blocks in size while beyond, on the Willamette, barges, ships and canoes headed toward the Columbia River. A portage road (later a railway and boardwalk) led around the Falls and into the City. Workers ported crops from the upriver Champoeg and Tualatin Plains farms into town for sale or reshipment on downriver boats. The Falls themselves supplied power to mill lumber and a prime location to fish for salmon and sturgeon. By the 1850s there were nearby flour mills, dairy farms, boatyards, orchards, and businesses. The earliest Oregon Trail emigrants expressed delight with typical end-of-the-Trail fare; they had arrived in Oregon during prime salmon, camas root (potato-like tubers), and berry season and just before the harvest of Willamette Valley crops. In later years, travelers stopped at Foster Farm, just a day or so before the end of the Barlow Road; in the late 1840s and early 1850s, Foster's home was the first sign of civilization on the Trail after the Indian agency on the Umatilla River. Emigrants could corral and graze their animals at the Farm while, for 50 cents, they dined on large portions of beef, potatoes, slaw, and biscuits. At Oregon City, after six months of grueling travel over 2000 miles, newcomers might rest a bit and resupply in town at establishments such as Abernethy's Store. Since the end of the long journey came usually in September, quite a few spent the winter in Oregon City hotels or tent encampments. But most were in a hurry to secure the promise that drove them along the Oregon Trail--their own piece of land. A final Oregon Trail journal entry (James Nesmith, 1843): "Friday, October 27.-- Arrived at Oregon City at the falls of the Willamette. Saturday, October 28.-- Went to work." "The banks of the river throughout are low and skirted in the distance by a chain of moderately high lands on each side, interspersed here and there with clumps of widespreading oaks, groves of pine, and a variety of other kinds of woods. Between these high lands lie what is called the valley of the Wallamitte, the frequented haunts of innumerable herds of elk and deer.... . In ascending the river the surrounding country is most delightful, and the first barrier to be meet with is about forty miles up from its mouth. Here the navigation is interrupted by a ledge of rocks, running across the river from side to side in the form of an irregular horseshoe, over which the whole body of water falls at one leap down a precipice of about forty feet, called the Falls." Descriptions of the country from early Oregon visitors such as Ross and missionaries Jason Lee, Marcus Whitman, and Elija White sparked the Oregon emigration. In the late 1830s and early 1840s, publicity from Oregon boosters deliberately fed the land fever. With some hyperbole, Peter H. Burnett (later, governor of California) informed potential pioneers about the Oregon promise: "Timber", he wrote in 1844, "...in inexhaustible quantities on the Columbia and Willamette, just where the water is at hand" to drive mills for lumber and flour. "The water power at the falls of the Willamette can not be surpassed in all the world." And after the land is cleared of trees "....the timbered land will be the best wheat land in this country." The notion of Manifest Destiny (expectation that the US should stretch from coast to coast as the dominant power of the Americas) and more than a touch of rivalry with the British also pushed the idea of Oregon as a new frontier for Americans. "Destiny" declared that the land was (or would be) cleared of all obstacles to US possession and settlement. 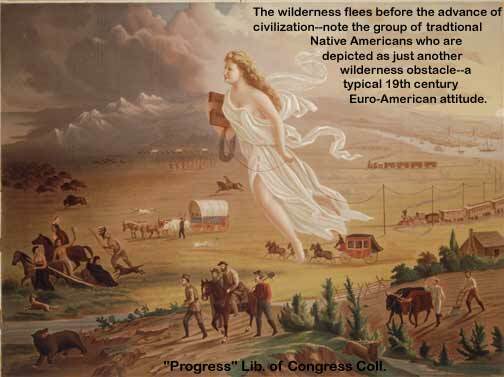 American pioneers on the Trail in 1844 would technically enter Oregon Provisional territory when they crossed the Great Divide and the Rocky Mountains. Oregon's Provisional government had hopefully set Clackamas's eastern border along the Rocky summit, its northern reach at Russian Alaska with Oregon's southern boundary at 42° and Spanish California. It was a grand vision. Even if Clackamas County eventually shrank to a region within much smaller borders, the United States did eventually secure all the land to the east, a lesser amount to the north, and a great deal more to the south. The story of Clackamas County--actually several stories--begins in the opening decades of the 19th century. The story about the First People of Clackamas County is one of nearly inconceivable sorrow. An Indian population of perhaps a million people and complex cultures that had evolved over thousands of years were nearly lost to disease. The survivors--perhaps a tenth of the original Indian population of the Northwest--are the subject of a second story; on reservations the small remnants of various tribes (often quite different in language and culture from each other) joined to preserve and revitalize tribal culture. Oregon Indian treaties that pushed Clackamas's Native Americans to reservations (beginning in the 1850's) were inflicted on a people who had lost most of their family and tribe within a single generation. By the time of the first emigration on the Oregon Trail--1841--very few of Clackamas County's first people remained. Another story tells the tale of early American/European exploration and trade in the Northwest; during these early decades the stage was set to create Oregon as an American--rather than Spanish, or Russian, or British--frontier state. American fur traders and adventurers in the mountains are also part of this tale; these men would blaze the Oregon Trail, guide the wagon trains, and become some of the first American citizens of the Oregon country. The first nonnative settlers in the Northwest, however, were not Americans but (mostly French) Canadians and part-Indian families, the Metis. The story of these former employees of the British fur companies who began farms in the early 1820s form yet another thread in the making of Oregon. 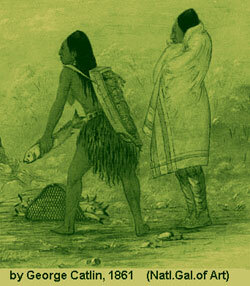 As the fur trade ended, Americans with Indian wives joined the early settlements. Their way of survival and much of their culture was adopted from Native Americans; their common language was Chinook Jargon. Former fur-trappers greeted and helped to establish Protestant American missionaries in the Oregon country. The missionaries found little success among the dying Indian population but were instrumental in encouraging and supporting emigration from the United States. Mission leaders and institutions became the core of early American government and settlement. The story of the Oregon missionaries ushers in the era of the great migration along the Oregon Trail. At this point--the beginning of the 1840s--both the Oregon Trail and Clackamas County were born. On a narrow strip of land between a steep cliff and the Willamette River, Oregon City grew from Dr. John McLoughlin's old mill site and the newly established Methodist Mission outpost. Nestled between the Clackamas Rapids and the Willamette Falls--both former rich Indian fisheries and trading villages--Oregon City became the center of trade along the rivers between the coast and the farmlands of French Prairie and Tualatin Plains. Here--at Abernethy Green near the mouth of the Clackamas River at the Willamette-- was the end of the Oregon Trail. In 1842, the nonnative population was tiny--only 300 to 500 in all of the Pacific Northwest--but contained an astounding variety of people. Beginning with the Astorians in 1810, travelers from the States arrived by ship from New England or overland from Missouri and Spanish California. 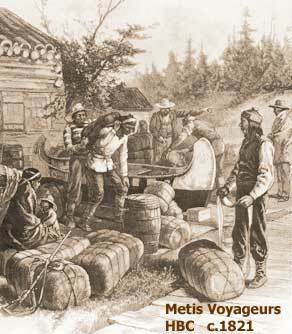 The fur trade also attracted the Hudsons Bay and Northwest companies which employed French, British, and Scottish Canadians as well as emigrants directly from Europe. Hawaiians came with the very first fur trading ships and stayed to assist at the American missions. By the mid 1830's, missionary fervor brought more emigrants from Canada and the States even as the fur trade collapsed. Several African American fur traders were among the early mountain men and adventurers in Oregon; a few dozen individuals and families also traveled the Oregon Trail and made their homes in Oregon prior to the Civil War. The first wagon train with a large contingent of African American settlers, however, was met with laws excluding both slave and free blacks in 1844. The harsh ban on free blacks was not enforced and a few African Americans remained to contribute to the variety of Oregon's people. The majority of Oregon Trail emigrants were agricultural settlers of English, Irish, and Scottish stock. Previous generations had settled the piedmont and tidewater regions of the South and then moved with the frontier into the Midwest, especially to southern Ohio, Illinois and Indiana. A great many of those bound for Oregon had left the most recent frontier settlements in Kentucky and Missouri, entire families relocating for a second time to homestead on the American frontier. Even without mentioning the shipwrecked Russians, Japanese, and Aleuts reported along the Columbia River, we can characterize the trickle of population into Oregon during the early years as very complex. Beginning in 1841, the Oregon Trail turned the trickle into a tide and firmly characterized the population as American. Until the opening of the Oregon Trail, the British were the most organized force in the Northwest in the form of the Hudson's Bay Company with its chief at Vancouver [Washington], Dr. John McLoughlin. The international border was unsettled in 1844 and the British government dispatched spies and surveyors to assess their claim to the Oregon Country. Granted a monopoly in trade over all of the Northwest by the British Crown, the Hudson's Bay Company expected their hired servants (fur trade employees) to go home at the end of their terms; recently, the Company had attempted an agricultural colony of subsidized sharecroppers. But quite a number of these "British subjects" relocated south of the Columbia River for settlements in the American pattern: a free land claim for any emigrant to work for his own benefit. 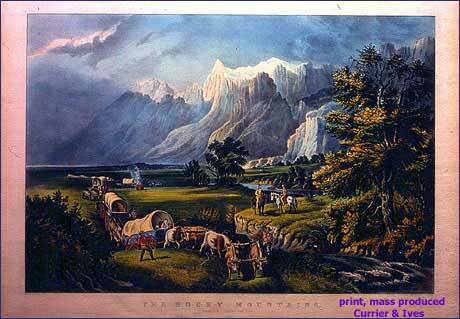 More than anything else, the promise of land also drove the wagon trains along the Oregon Trail. As well as noting Americans "hostile in feeling to British interest" after 1844, McLoughlin highlighted that emigrants were encouraged "...by the expectation held out by [U.S. Senator] Linn's bill that every male above eighteen years of age would have a donation 640 acres of land, a wife 320, and all under 18 would have 160 in any part of the country." When McLoughlin sent a dispatch to London headquarters to explain why he had been powerless to prevent American expansion in the Oregon country, he ended the summary of each year's events with a terse tally of arrivals on the Oregon Trail: "In 1844 the immigrants amounted to 1, 475 men, women, and children....The immigrants in 1845 amounted to 3000 persons..
Dr. John McLoughlin left the Hudson's Bay Company in 1846 to take up his personal land claim at the Falls of the Willamette. McLoughlin became a US citizen in 1851 and was elected mayor of Oregon City. For his generosity and leadership-- to both British and American subjects-- Dr. McLoughlin is know as the Father of Oregon. Only two years separate the opening of the Oregon Trail as an emigrant road, 1841, and the creation of the District of Clackamas in 1843 under the Oregon Provisional Government. The sheer number of emigrants in search of land rapidly won the Oregon country for the United States rather than Britain. The earliest arrivals on the Trail--about 100 travelers in 1841--were joined by nearly 1000 newcomers in 1843. In that year, 1843, voters among former American fur trappers, ex-employees of the Hudson's Bay Company, pioneer French Canadians, and American missionaries established the Oregon Provisional Government. This government was not an official part of the United States. By the next year, however, as the Oregon Trail brought hundreds of Americans into the region, settlement and government in Oregon became thoroughly American. Numbers of immigrants grew every year after the opening of the Oregon Trail and, in the peak year of 1850, some 55,000 pioneers made the journey. This tide of emigration ebbed and flowed with economic booms and busts in the Midwest and Oregon, surged several times with the discovery of gold, and streamed steadily into the West. Oregon became a U.S. Territory with its capital in Clackamas's Oregon City in 1848 and a State in 1859. The Civil War and the Indian Wars of the 1870's choked travel on the Oregon Trail. But within a decade the flow of population into Oregon renewed, continuing through the end of the century along the cross-continental railroad as well as the Trail. CLACKAMAS COUNTY YEAR-BY-YEAR, 1800 - 1900: An informal history with lots of pictures, links, and name-dropping. 1800 to 1843: The Birth of Clackamas County---Clackamas Native Americans first encounter explorers and fur trappers of the Astor, Northwest, and Hudson's Bay companies; disease devastates the Pacific Northwest; missionaries come to Oregon; the Oregon Trail begins; new towns established in Clackamas County at Oregon City, Linn, and Multnomah; settlers create the Oregon Provisional Government. 1844 to 1848: Oregon Becomes US Territory---the Barlow Road and a tide of emigration on the Oregon Trail; new towns at Portland, Eagle Creek, Canemah, and Willamette; the British quit Oregon; the Cayuse War; Oregon joins the United States as a Territory. 1849 to 1859: Oregon Becomes a State---the Donation Land Claim Act; more settlers create new towns at Barlow, Damascus, and Milwaukie; steamships, mills, and ferries; Indian treaties and reservations; Oregon is admitted as the 33rd State in the US. 1860 to 1900: End of the Pioneer Era---foundation of Oswego, Carver, Canby, and Molalla; railroads come to the county and the state; locks and a fish-ladder on the Willamette River; floods and freezes; electricity from Willamette Falls.